October 6, 2018: The Longmont Symphony Orchestra’s Happy Birthday, Lenny! – The Chorale will be guest artists for the LSO’s concert which celebrates Leonard Bernstein’s 100th birthday at Vance Brand Civic Auditorium in Longmont. *Buy tickets at www.LongmontSymphony.org – this concert is not included in our 2018-2019 Season Tickets. October 14, 2018: Comin’ for to Carry Me Home – Songs of Faith, Hope, and Deliverance. Our season’s first major concert features African-American Spirituals. Venue: LifeBridge Christian Church in Longmont. December 2, 2018: Holiday Classics in 21st Century Gift Wrap – Our holiday concert of new holiday arrangements of old favorites, with Apollo Chamber Brass at LifeBridge Christian Church in Longmont. 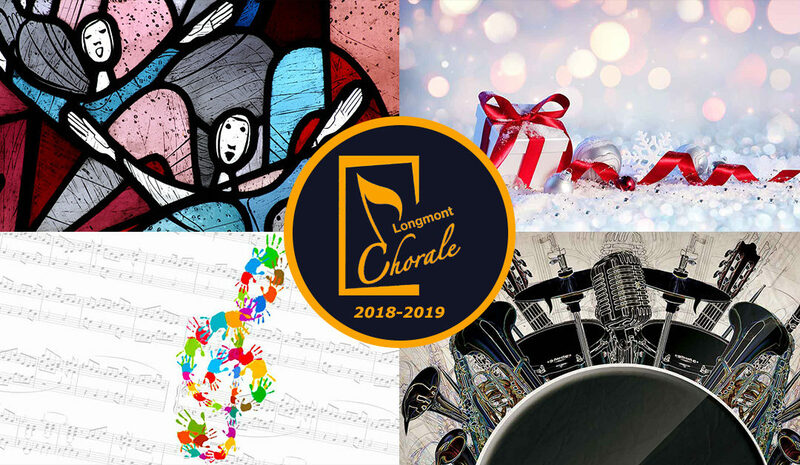 December 16, 2018: The Longmont Symphony Orchestra’s Candlelight Concert – The Chorale Singers will be guest artists for the LSO’s concert of chamber music at Westview Presbyterian Church in Longmont. *Buy tickets at www.LongmontSymphony.org – this concert is not included in our 2018-2019 Season Tickets. March 10, 2019: Rutter’s Mass of the Children, and Other Songs of Childhood, performed with the St. Vrain Singers and more of our local young singers. The Chorale and guest singers are accompanied by orchestra at LifeBridge Christian Church in Longmont. April 7, 2019: A Celtic Spring – A special performance of Celtic music with the Chorale Singers and Colorado-based Celtic duo Gadbaw & Krimmel. Venue: Westview Presbyterian Church in Longmont. *This concert is not included in 2018-2019 Season Tickets. May 5, 2019: In the Mood for Pops & Jazz – The Longmont Concert Band joins us for our Season Finale performance and fundraiser. *Venue for the May 5, 2019 concert is TBA.